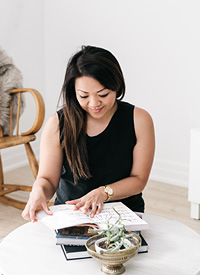 Printable Tags For Your Homemade Gifts — Love On Sunday Love On Sunday | Interior Styling in Toronto and the GTA. One of my favourite Christmas memories as a little girl was wrapping presents. Our living room would be filled with gift wrap, boxes and little embellishments to make your presents extra special. My Mom collected little ornaments and floral pieces to use as gift toppers and let me tell ya, this has really rubbed off on me. And since my goal this Christmas is to make most of my presents, I thought why not create some homemade tags to go with them! I scored an amazing stack of card stock at the Dollar Store for $2 and went to town. I've created 2 versions and 2 sizes. The first size (2.5") fits into most mason jar covers. Just cut them out, pop them in and you're done! Special thanks to my friend Monda who gave me this delicious jar of homemade apple butter to use in my photo. I had to use some trickery for this photograph because that jar is pretty much done. Homemade presents are the best aren't they? I've also created smaller tags (1.5" round) which can be used for other homemade gifts. And it's yours to print for free! Simply click on the link below to download the PDF file. Enjoy!